Fri., Dec. 23, 2011, 10:48 a.m. Round two. First attempt at my day-after Air Force post vanished before my eyes. So here we go again. Here are the links: S-R game story, photos. Other links of interest: Butler, two days after losing at GU, toppled Stanford, Saint Mary's lost to No. 6 Baylor, WSU thumped Pepperdine and Portland (visits GU on Wednesday) lost its sixth straight, falling to Nevada. --One minor fix to my game story: I mentioned Sam Dower’s drive and feed about midway through the article. It actually led to a 15-foot corner jumper from Gary Bell Jr. (not a 3). --Let’s begin with Robert Sacre, who played 19 ineffective minutes after dislocating his right (shooting) thumb in Wednesday’s practice. The picture above shows the black wrap he wore to brace his thumb, but he was clearly bothered by the injury. He didn’t attempt a shot and at one point was shaking his hand after contact with an Air Force player. He didn’t return when Dower entered about 3 minutes into the second half. Sacre wasn’t having much to do with a discussion about his thumb or his declining production over the last few games. His four lowest scoring games have come in GU’s last four games. --Gonzaga found the right combination of players when Dower, Bell Jr., Kevin Pangos and Elias Harris were on the floor together for the majority of their decisive second-half run. Dower gave GU inside production and four key offensive rebounds. Harris hit four free throws and had a nice kick-out pass to Pangos for a 3. He also had a putback of a Dower miss. Bell Jr. showed his patience, much like Tuesday’s game, and scored from beyond the 3-point line, in the mid-range and with a nifty 5-footer off the bounce. Dower made 5 of 9 shots, 6 of 10 FTs. He also finished with three steals, a block and an assist. --Reynolds’ team hadn’t played since Saturday so he took a good, long look at the Zags on video. --Pangos played 38 minutes (11 more than the next closest Zags, Dower and Harris) and didn’t have a turnover. By contrast, four Air Force starters logged at least 33 minutes and it probably would have been all five but Michael Lyons injured his ankle 3 minutes into the game. --All three of Harris’ assists led to Pangos’ 3-pointers. --Mathis Mönninghoff saw his first appreciable playing time in a while with 5 minutes in the second half. With Air Force’s matchup zone (or man) trying to limit the inside game, Mönninghoff was put in for his perimeter shooting ability, but he missed his lone 3 attempt. However, his rangy 6-7 frame helped on the wing when GU effectively utilized its 1-2-2 zone. --GU was 20 of 27 at the FT line compared to Air Force’s 10 of 15. Gonzaga has had more FT attempts (often considerably more) in nine of its 11 games. They had the same number (21) as Western Michigan, and fewer attempts (15 vs. 18) against Notre Dame. 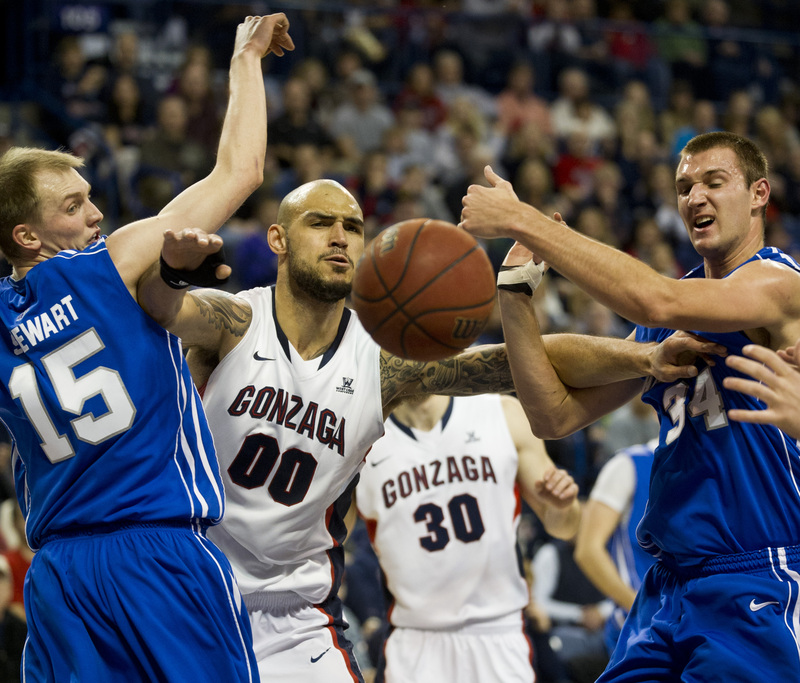 For the season, Gonzaga has attempted 306 FTs to opponents’ 162. --Pangos is back on top as GU’s scoring leader at 14.5 points, followed by Harris at 13.8. --With games of 12, 10, 9 and 16, Dower’s scoring average has climbed to 7.4. He was at 4.9 after the Michigan State game. Dower’s 8 rebounds tied a career high. --The undersized Falcons outscored GU 24-22 in point paints, despite running an offense that rarely had a player stationed in the post. Those points came on drives, cuts and putbacks. --GU’s bench, led by Dower, outscored Air Force’s 25-8. --Of Gonzaga’s 70 points, 56 were scored by freshmen (Pangos 23, Bell Jr. 10, Ryan Spangler 1), sophomores (Dower 16, David Stockton 5) or first-year Zags (Guy Landry Edi 1). The other 14 points were by junior Harris (12) and senior Carter (2).